“I prefer a guy that knows the Western Conference. I want a guy that’s hands-on. I want a guy that’s a good communicator. 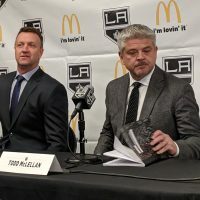 I want a guy that’s preferably not over-the-hill…And, quite honestly, I’d prefer if they were a better coach than me.” – LA Kings head coach Darryl Sutter just a few weeks ago, when talking about his search for a new assistant. Today, the team officially hired 41-year old former St. Louis Blues bench boss Davis Payne. On paper, he meets nearly all the criteria above. Better coach? Well, that remains to be seen, as Payne doesn’t have ‘Stanley Cup Champion’ on his resume yet – Sutter does. With the hire though, LA adds a guy who has played and coached at the ECHL, AHL and NHL levels. He also has several interesting ties to the Kings organization, including being a teammate of current goaltending coach Bill Ranford. – Coached 137 games for the Blues between January 2, 2010 and November 6, 2011. He led the club to 67 victories in that span, with his first win coming against the Kings. It was a 4-3 victory in Los Angeles. – During the 1993-94 season Payne turned a rather unusual hat-trick, he played for three different teams…in three different leagues – Rochester Americans (AHL), Phoenix Roadrunners (IHL) and Greensboro Monarchs (ECHL). At the time, Phoenix was the Kings’ top minor league affiliate, similar to what Manchester is today. His Roadrunner teammates included Mark Hardy, Robert Lang and Brent Thompson. 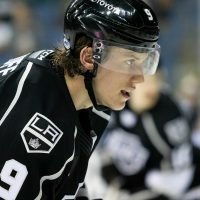 Given that Payne wasn’t drafted by the Kings, he was likely signed as a minor league free agent to round out the roster. Years later, Thompson and Payne would coach together in Peoria, the Blues’ AHL affiliate. – As for his relationship with Ranford, they were teammates on the Bruins over the course of two seasons. When Payne was called up to Boston during the 1995-96 season, he made his NHL debut on a roster that included Jozef Stumpel, Shawn McEachern, Sandy Moger and Steve Heinze. Plus, they also had two guys named Bourque and Neely. Game five of his rookie campaign came vs. the Kings in Los Angeles at the old Forum. Things ended in a 3-3 tie with one of the Kings’ goals coming from Kevin Stevens, who Boston had just traded to LA a few weeks prior. – Payne’s NHL on-ice debut came February 7, 1996 in Buffalo. His Bruins lost the game 2-1 in overtime to a Sabres team that featured Garry Galley, Charlie Huddy and Alexei Zhitnik. He also got into a fight with Bob Boughner (see video above). Payne played 15 more games for the Bruins the following season, his last run as an NHL player. Like his debut, he capped things off in a game vs. the Sabres – which Buffalo also won, 5-1. Coaching the Bruins that season were two guys who also had Kings connections, Steve Kasper and Cap Raeder. – Davis tweets from his personal account at www.twitter.com/DavisPayne4. Why the four? Don’t know yet. He was a forward and that’s usually a number reserved for a defenseman. Perhaps it’s an ode to his two NHL fights. In addition to the scrap mentioned above, his only other fight was with Brian McCabe (video here). Both of his opponents wore #4. Weird. 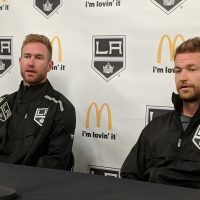 – More connections galore – While the Kings were busy going to their first Stanley Cup Finals in 1992-93, Payne was playing in the ECHL alongside future King (and future NHL Coach) Dan Bylsma. 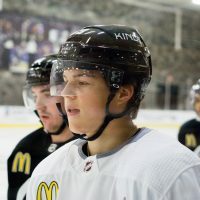 The following season he played two games for the Rochester Americans (AHL), a group led by future Kings assistant coach John Van Boxmeer and a roster that featured a slew of now former LA Kings – guys like Philippe Boucher, Sean O’Donnell and Denis Tsygurov. – A year later he was playing in Greensboro (ECHL), playing for team that had John Torchetti as the Assistant Coach. Few will probably remember this, but Torchetti actually was the head coach of the Kings for a brief time – as in, very brief. He took over the duties for just 12 games, replacing Andy Murray, at a time when the Kings still had a shot at the post-season. Instead, Torchetti led LA to a 5-7 record and he wasn’t brought back by new GM Dean Lombardi. – During the 1994-95 season he played 11 games with the New Jersey Rockin’ Rollers, a member of the Roller Hockey International league. Out west, Hardy and Jim Fox were coaching an LA based team in the same league. – In 1995-96, with the AHL’s Providence Bruins, Payne was teammates with Mark Bavis. Of course, Bavis would later become a scout for the Kings and tragically lost his life in the 9/11 terrorist attacks while on his way to LA for the opening of training camp. – Payne played four years of college hockey at Michigan Tech, the campus that former Kings defenseman Tim Watters called home from 1977-1981. While Payne was in college he crossed paths with several future NHLers, including the 1990-91 University of Minnesota team which featured future Kings Craig Johnson, Trent Klatt, Chris McAlpline and Doug Zmolek. He also took on Gary Shuchuk’s Wisconsin Badgers during his freshman and sophomore years. Finally, this isn’t all hockey related, so consider it a bonus tidbit. Payne was born on September 24th, a birthday he shares with Dan Maloney, who played left wing for the Kings from 1972-75 and led the team in penalty minutes in ’74-75. Other famous people born that day include Howard Hughes, Fabio, Linda McCartney, Phil Hartman, Jim Henson and Arthur Guinness. Welcome to LA Davis Payne. As always, a great article with information you can’t find anywhere else… your site is such an asset to Kings fans everywhere.